The story that was developing over the weekend finally broke as Carillion plc has gone into compulsory liquidation. Carillion is one of the largest contractors of the UK public sector and holds a very large number of contracts for a range of infrastructure and services projects. The immediate concern of the UK government will now be how to ensure continuous provision of those services (which include catering and cleaning services for schools and hospitals), and finding ways to ensure completion of the ongoing infrastructure projects, possibly through ‘bringing them in-house’ or re-nationalising the contracts–although it seems a reasonable to question whether there is capacity in the civil service and in local government to manage such a volume of complex outsourced contracts. However, that is not the focus of this post. In my view, one of the aspects that should not go unnoticed in this crisis is that the public sector had had information pointing towards Carillion’s increasingly dire financial situation for a while. Indeed, as The Guardian reports, “Carillion ran into financial difficulties last year after issuing three profit warnings in five months and writing down more than £1bn from the value of contracts. It has debts of about £1bn and a £600m pension deficit, and is being investigated by the Financial Conduct Authority over announcements made between December 2016 and July 2017.” Very clear information about Carillion’s severe financial difficulties was in the public domain in November 2017, and the first of the three consecutive profit warnings had been issued as early as July 2017. Here, I offer some thoughts on the share of responsibility that could arise for UK contracting authorities due to poor management of the systemic risk created by the accumulation of contracts on Carillion’s hands, including some awards completed after Carillion published information of its financial difficulties (for example, a 4-year £84mn contract for energy maintenance and repair services for public housing in the Belfast region in November 2017). The UK Government should not be able to decline all responsibility, as it was informed and monitoring the situation. Indeed, The Guardian reported three months ago that “The government, one of [Carillion’s] major customers, said it was being kept informed. ‘We remain supportive of their ongoing discussions with their stakeholders and await future updates on their progress,’ the Cabinet Office said”. Domestic public procurement law (in particular, reg. 58 of the Public Contracts Regulations 2015) empowers contracting authorities to monitor the economic and financial standing of tenderers before they award contracts. It is explicitly stated that “Ratios, for example that between assets and liabilities, may be taken into consideration where the contracting authority specifies the methods and criteria for such consideration in the procurement documents, but such methods and criteria shall be transparent, objective and non-discriminatory” (reg.58(10) PCR2015). It has been long standing UK Government policy to assess the financial risk implicit in the award of a contract due to the economic and financial standing of the would-be contractor. Currently, the relevant guidance to that effect is in the Procurement Policy Note on ‘Supplier Financial Risk Issues’ of 2013, which requires contracting authorities, as part of a regular procurement exercise, to “Assess the risk to public sector business and/or public money which would result if a potential provider bidding for a contract were to go out of business during the life of the contract, or have inadequate financial resources to perform the contract”. 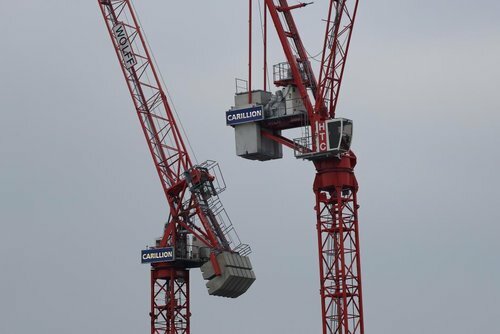 There is no question, then, that contracts recently awarded to Carillion should be under suspicion of potential shortcomings in the assessment of its economic and financial standing. Of course, this may be complicated due to the certainly complex corporate structure in which the industrial conglomerate is organised, but the fact that self-certification has been operative in the UK since 2016 (at least in theory), raises important questions as to the ability of contracting authorities to carry out effective monitoring of tenderers’ capabilities and the financial risk implicit in contracting. On that note, it should also be recognised that the monitoring of the contractor’s economic and financial standing is largely limited to procurement phases prior to conclusion of the relevant contract. This raises a more important point concerning the difficulties in managing systemic risks that derive from the accumulation of public contracts in the hands of a single supplier (however it is divided internally), which require a more complex and decentralised policy requiring effectiveness of the policies facilitating SME participation in procurement, which certainly remains an unresolved issue in the UK and in other EU jurisdictions. Given that large public sector contractors subcontract very significant volumes (if not the majority) of the works and services to SMEs, important questions should be raised as to the effective value for the public sector of allowing for the intermediation of such ‘public contract brokers’. In my view, this is reflective of the continued erosion of public sector capability to manage and oversee contracts (big and small), which requires ‘ready-made’ bundled contractual solutions. If the situation is to be reversed, in my view, governments should make a clear commitment to invest in the required skills and resources to ensure that the provision of important public services and the development of strategic infrastructure is not affected by systemic risks that go unnoticed or are unmanageable once realised. This is not a legal problem, but mainly a political issue that requires committing the required level of funding in rebuilding the capacity that the public sector has lost. Given pressures in other areas (such as direct NHS funding), this is certainly a big ask. But, unless the public sector re-skills itself, not only the management of crises, but the regular operation of public services will continue to be dependent on the ups and downs of the private market–where undertakings, however big, are not too big to fail. I am a Reader in Economic Law at the University of Bristol Law School, a Member of the European Commission Stakeholder Expert Group on Public Procurement (2015-18), a Member of the European Procurement Law Group, and a Member of the Procurement Lawyers’ Association Brexit Working Group. This entry was posted in Business and economic policy and tagged Carillion, contract termination, crisis, liquidation, nationalisation of contracts, public procurement, Risk, systemic risk by policybristol. Bookmark the permalink.